Charters schools are public schools. Read more in our FAQs below. A charter school is a public school that has been given some autonomy from state education regulation and bureaucracy. In exchange, the school must be accountable for student achievement and fiscal solvency. The “charter” is simply a license to operate – hence the name ‘charter schools.’ It is granted and regularly reviewed by the local school district, county office of education, or state department of education. This process varies across the country. No. Charter schools are public schools. Families do not pay tuition for students to attend, and there are no entrance exams or other requirements often associated with private schools. Many aspects of Aspire’s education design (such as our small schools) sometimes remind people of the quality of education in many private schools. How is Aspire different from other charter schools? Since charter schools were ‘created’ by legislation, most charter schools were founded and run by a small group of parents or teachers. These stand-alone schools were created by brave, determined and sometimes seemingly super-human individuals. Because it’s so hard to start a school, it makes sense for groups to work together with others who have complementary areas of expertise. Many new charter schools are being started by “charter management organizations” (also known as CMO’s, for short): organizations that establish and run multiple schools. Aspire is widely considered the leading not-for-profit CMO. As a 501(c)3 non-for-profit, Aspire is focused on ensuring all its students receive a high-quality education within an efficient and cost-effective model. Aspire Public Schools has NO admission requirements. Any student who is a California state resident is eligible to enroll. If the number of students interested in enrolling in an Aspire school exceeds the school capacity, a lottery is held to determine enrollment. As a system of public schools, Aspire does not charge tuition. There is a lot of confusion about this topic in the media. Charter schools are funded by state, local and federal funds in the same way that non-charter public schools are. In general, both revenues and expenses follow the student. When a family chooses to send their child to a publiccharter school, the charter school is then responsible for providing that student’s education. Therefore, it incurs the expenses of the teacher, facility, textbooks and supplies. For that reason, funding for that student goes to the entity that is providing the public education. How big are Aspire schools? We believe in small schools so that individual students are personally known. Students do not “slip through the cracks.” Elementary schools (grades K-5) are about 360 students; secondary schools (grades 6-12) are about 560 students. What are the average class sizes at Aspire campuses? 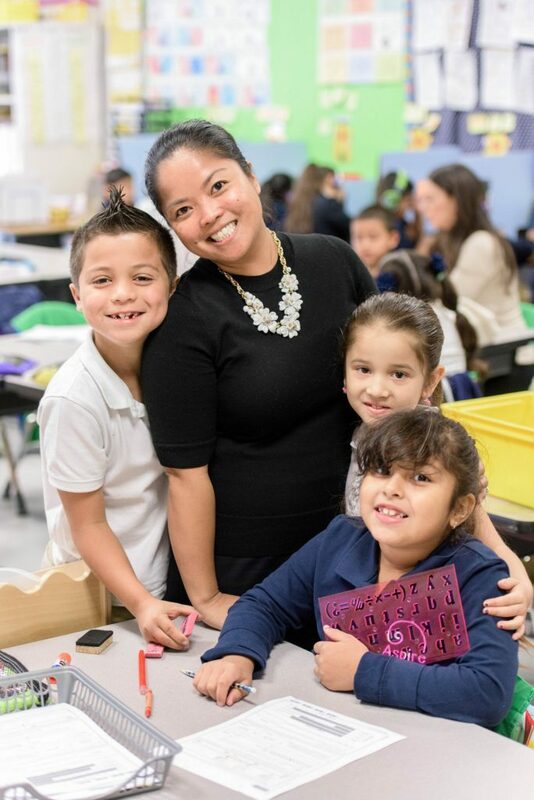 Aspire schools have a student:teacher ratio of approximately 24:1 in grades K-3, and 29:1 in grades 4-12. In addition, secondary students spend part of their day in classes with ratios as small as 17:1. Does Aspire have a school uniform policy? Each school community determines whether a uniform policy is appropriate. Most Aspire campuses do have uniforms. Do you have a question that was not answered here? Send us a message. Contact Us.